I’ll be the first to admit that I’m not a great reader. It’s not that I don’t enjoy it, I just find that I either struggle to find the time to sit and read, or I’ll be easily distracted from it. So to find that I’ve read this particular book twice already in the few weeks that I’ve owned it – is quite something! 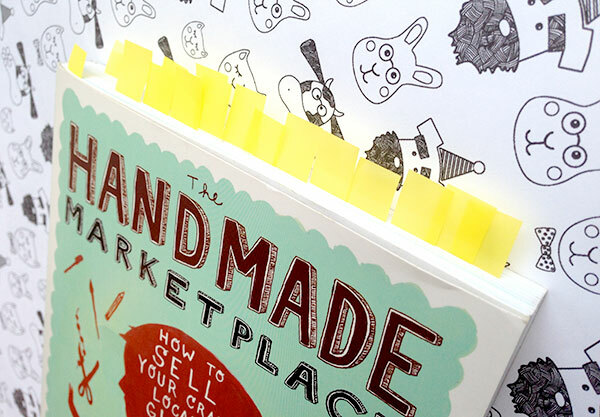 The Handmade Marketplace by Kari Chapin has been a real joy to read, not only because it’s informative on a wide range of topics relating to running a craft business, but because it’s easy to read. No jargon, no elongated explanations, just straight talking advice in a friendly tone. As though you were chatting to Kari yourself over a coffee. I’d seen the book advertised for quite some time and I’d always think to myself, “I must take a closer look at that some time”. Inevitably, I’d keep forgetting to! So after spotting it again whilst doing some photography research, I went for it and ordered myself a copy. Wow, what an inspiration! Kari covers it all, from the very beginning of developing your message and branding, basic business practices through to marketing, publicity, selling and approaching retailers. It’s also full of advice and case studies from successful craft business owners, with insightful stories and handy tips. Suffice to say that my copy is incredibly well thumbed and full of notes and book markers! A handy resource that I’m sure I’ll continue to dip into as I develop Nook and Crannie, and one that I certainly recommend to fellow makers. This entry was posted in Inspiration, Studio Scoop and tagged advice, book, business, craft, guide, handmade-marketplace, inspiration, kari-chapin, resource, review. Bookmark the permalink.